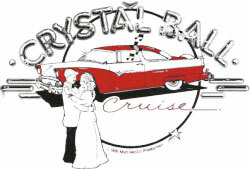 Please visit official website of Crystal Ball Cruise Association - click here. For 10 years, Matt McGill contentedly pounded out dents and replaced body panels as owner of a collision repair business in Brewerton, N.Y. Customers were steady, business was good. But something began to bother him. Each year, the number of wrecked vehicles attributable to teenage drinking and drug abuse began to grow. In McGill’s mind, each damaged vehicle represented a shattered dream and unfulfilled promise. "I knew I had to do something," McGill said. "But what? How could I make a difference in my community? I had only two things to offer: my time and my God-given talents in the automotive industry." McGill came up with what seemed a simple and worthwhile community project. He would pick one high school — initially his alma mater — and make a deal with the seniors. If they would pledge not to drink or use drugs for just one day, he and his pals would chauffeur them to the prom in a classic car. He christened his project the Crystal Ball Cruise after the hanging mirror ball that projects thousands of rays of light down upon the dance floor. "That’s what I wanted this project to be," he said, "a ray of bright light to the youth of my hometown." Three recently released national studies confirm that alcohol and drug abuse among teenagers is substantially higher today than it was 10 years ago. The reason for this increase is the subject of presidential debate. McGill had big fun as a kid attending stock car races with his father, racing go-carts and building street hot rods. "My idea of fun was working on cars," he said. "I went to car shows, met mechanics and absorbed everything I could about cars simply because it was fun. "Unfortunately, kids today don’t have a hobby or a passion. Many of them think drinking or using drugs is fun. I want to help change that, even if it’s just for one day." Looking back, he wishes he had a real crystal ball when he conceived the project. "No one disputed the need for such a program," he said. "Everyone agreed it was a great idea." But as the project transformed from dream into reality, hundreds of what McGill charitably labels "challenges" began to appear. His first roadblock entailed convincing educators of the worthiness of the project. "Most of the school counselors said this project wasn’t going to make a difference because the kids were pledging not to drink or use drugsuseuseuseuse yii\helpers\Html; yii\helpers\Html; yii\helpers\Html; yii\helpers\Html; for just one day, " McGill said. "I know it’s just one day. But it’s a start. Maybe one kid who pledges not to abuse alcohol or drugs for just one day will go two days, then a week, a month or a year. We have to start somewhere." Certain educators then complained that the Crystal Ball Cruise did nothing for the "at-risk" kids who wouldn’t be interested in attending the prom. In response, McGill formed the "Purple Gang," a program designed specifically for at-risk kids that allowed them to build, assemble, paint and race a dragster at a local track. "Forming the Purple Gang presented another set of obstacles," McGill said. "Bottom line, we put together a very rewarding program in order to further the Crystal Ball Cruise and overcame the ‘nothing for the at-risk kids’ objection." McGill’s next challenge was to convince dozens of antique automobile owners to contribute their time and vehicle for a worthwhile cause. "These guys are extremely proud of their cars and have a lot of money invested in them," McGill said. "Some were wary of donating their time and vehicle. But in the end, almost all saw the value in the program and wanted to contribute." The biggest hurdle, however, came from a familiar small business adversary: the issuers of liability insurance. "You wouldn’t believe the hoops we had to jump through to get insurance," McGill said. "The schools wanted legal protection in case someone slipped getting out of the car. The drivers wanted protection in case someone fell. The costs were outrageous." The liability issue eventually forced McGill’s high school alma mater to withdraw from the Crystal Ball Cruise. "Don’t get me started on the insurance," McGill said. "The liability monster will consume us all if we don’t do something about it. There’s something wrong in this country when a community has to take playground equipment out of a park because of insurance costs. The less I say here the better." Once those obstacles were overcome, McGill restored a 1937 Ford "Paddywagon" for the event and hosted a reception for the students at his shop. A total of 63 antique cars then paraded around the city and drove the kids to the prom. After the inaugural Crystal Ball Cruise in 1991, McGill took a year off to recover from the experience but has organized the event annually ever since. The 1997 Crystal Ball Cruise promises to be the biggest one ever. McGill dreams that one day the Crystal Ball Cruise will be a nationwide event, like the Great American Smoke Out. He can envision local and state competitions. "Imagine," he said, "one night a year when high school students across America pledge not to drink or do drugs and cruise to the prom in a classic car!" Some individuals accused McGill of creating the event to garner free publicity. "I wasn’t looking to make a name for myself," McGill said. "I was looking to contribute, to get off my duff and do something positive. Guys who get their hands dirty for a living aren’t always held in high esteem. But we can make a difference in our community." 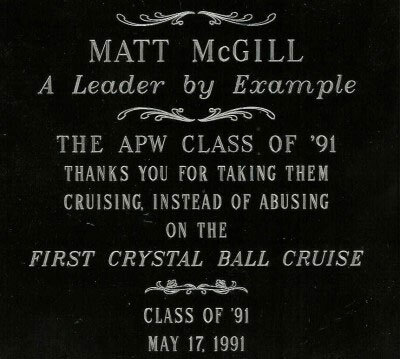 Rather than garnering free publicity, McGill’s involvement in the Crystal Ball Cruise cut his shop revenues in half. "We hired a full-time coordinator this year because it was simply taking too much time to organize," McGill said. "I didn’t have a family when I started this and now I do. I had to start concentrating on the shop again." Was it worth it? There’s a plaque that McGill proudly displays on the wall of his shop, given to him by the senior class at a local high school. "Matt McGill," it reads, "leader by example." You bet it was worth it, he says.